Well, it's raining for sure, but let's put this in perspective. The vegetables will be cleaner by the time you get them home. Rain like this makes cucumbers and tomatoes so exuberant to be harvested they start leaping off their respective plants almost faster than farmers can haul them in. Fewer customers mean plenty of time to peruse and chat about a new recipe, too. I see only benefits resulting from some damp shoes and a steamy train ride. Do consider a waterproof shopping bag, though. A new market I spotted while riding the train on a Saturday morning into the city center. That circle of red awnings in front of the Za-Koenji Public Theatre could only mean one thing! Sure enough, I found a small group of area growers and producers (plus a booth of folks from Niigata) and got a tour of the theatre. I'm so excited to find your blog, particularly the farmers market posts! We just moved to Tokyo from San Francisco (farmer's market heaven) and I was wondering what on earth I was going to do without my happy market days :) Very excited to see that there's a thriving market scene here as well! Welcome to Tokyo, Alyssa! There are heaps of markets, but not quite as many as San Francisco, I'm sure. I'm glad you found your way here and are ready to start checking out the markets. I'll be glad to hear your impressions when the time comes, too! I'm actually in Makuhari but had no time to contact you to get together. However, two friends of mine are interested in finding out more about local farms or organic farming. My one friend has a small piece of land in Funabashi next to her house- which she would like to start planting vegetables etc- she doesn't know how to start- cld I have your email address so I can give you her phone number and email address. 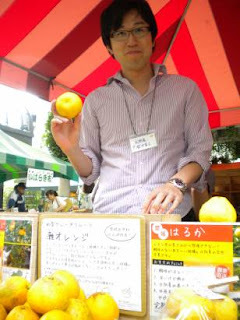 My other friend, living in Chiba, is going through chemo and wants to eat only organic and I thought you might be able to suggest some farmer's markets or some organic farms she can purchase vegetables from. Hi Anjuli!! Of course. My email is joandbailey at gmail dot com. They should send along any questions they like! Are you still here?